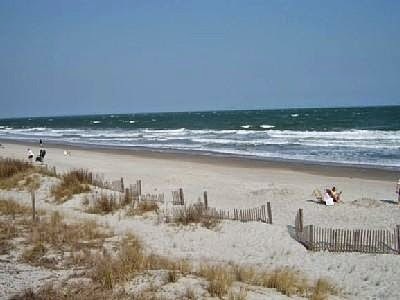 This ocean-view vacation rental by owner in Surfside South Carolina is clean & convenient with a fifth floor beach-view. This vacation home is located in the gated beachfront Myrtle Beach Resort with 24-hour gated security and 700 feet of private beach! This condo sleeps four via a queen bed and a pull-out. This vacation home come with an array of amenities including a heated 12 person jacuzzi, 2 sauna's, an exercise area & laundry room. Additionally, there is an in-house deli/cafe, two private, heated indoor pools, and several sauna's, jacuzzi's and workout-centers. There is also an ocean-side TikiBar that provides nightly entertainment for evenings when you want to stay close-in and just relax. Fully equipped kitchen has a cook-top/oven, dishwasher, microwave, and new full-size refrigerator. All kitchen utensils are provided well as coa ffeemaker, blender and central AC/Heat. Enjoy WIFI Internet Access along with cable TV & HBO. The property is convenient shopping, restaurants, outdoor activities and nightlife. Enjoy the mild Myrtle Beach weather with a game of golf or by relaxing on the balcony watching waves roll in. Located along South Carolina’s Grand Strand, between Myrtle Beach and Pawleys Island, sits Surfside Beach - a family friendly beach paradise.